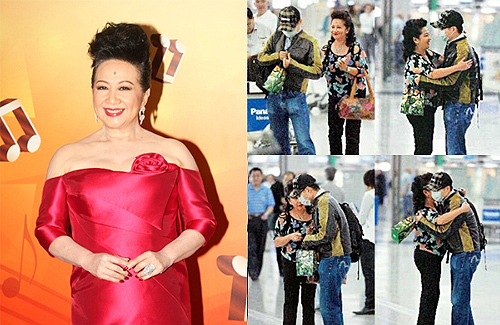 Above: Nancy Sit embracing Andy Chan at the airport. Experiencing a painful divorce in 1996 after her husband walked out on her, Nancy Sit (薛家燕) made a comeback in the entertainment industry in order to raise her three children. Appearing in the highly successful A Kindred Spirit <真情>, Nancy was beloved by viewers and became a highly-sought-after actress. While the media tended to focus on Nancy’s image as a good mother, the 68-year-old actress has been dating a younger man for the past 12 years. In 2004, Nancy admitted to dating a computer engineer named Andy Chan after they were photographed together at an airport. The two apparently quietly parted ways without the media finding out. During that time, Nancy only brought up Andy a few times and praised him for being a good boyfriend despite him being 17 years younger. In 2009, when Nancy fell ill and unconscious after a liver surgery complication, Andy flew back to Hong Kong from Mainland China to take care of her. Sadly, those were the last bit of news of Andy. Nancy didn’t mention his name afterwards. Recent news reports indicate that Nancy’s current boyfriend is a Shanghainese businessman who is 12-years her junior. In some photos, it was seen that this new A-Kuan also resembled her previous boyfriend, Andy. Opening up about her relationship, Nancy said A-Kuan actually proposed twice in the past. But Nancy rejected him because she has already been through one failed marriage, and doesn’t want to experience the pain and sadness again. She even considered giving up on her relationship with A-Kuan in the past. But they were unable to remain apart, and their love deepened after each breakup. Although Nancy loves A-Kuan deeply, she is willing to let him go if he finds someone better to get married and start a family with. I didn’t know Nancy was 68 already, wow. And her two younger BFs…good on her. I watched a YT documentary before about how there are really some guys who loooove older women (some are in it too, for monetary reasons.) So I believe it can be true love & affections.